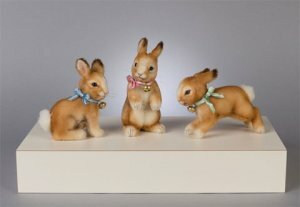 5", 2017, A delightful trio of bunnies just in time for Easter. Made from the finest Shulte mohair from Germany, artistic airbrushed coloration, jointed at the neck, glass pupil eyes, hand embroidered features, and inset horsehair whiskers. Wobble standing wears a pure silk pink ribbon and brass bell around his nect, Plunk seated wears a festive pure silk blue ribbon and brass bell around his neck, and Hop running wears a pure silk green ribbon and brass bell around his neck. Included will be the signed, numbered certificate of authenticity and the forms for owner registration. SPECIAL NOTE: the first 100 will be sold boxed together as matched numbered sets.